The Historic City of Ayutthaya, founded in 1350, was the second capital of the Siamese Kingdom. It flourished from the 14th to the 18th centuries, during which time it grew to be one of the world’s largest and most cosmopolitan urban areas and a center of global diplomacy and commerce. Ayutthaya was strategically located on an island surrounded by three rivers connecting the city to the sea. This site was chosen because it was located above the tidal bore of the Gulf of Siam as it existed at that time, thus preventing the attack of the city by the sea-going warships of other nations. The location also helped to protect the city from seasonal flooding. 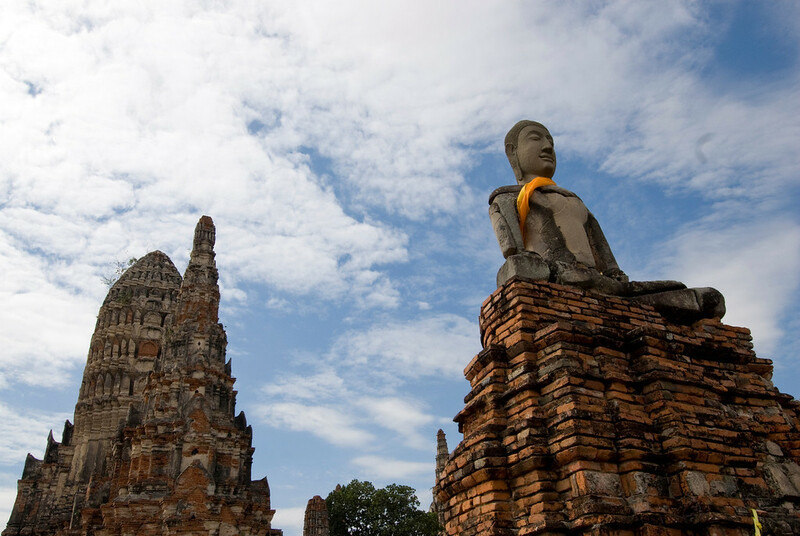 Ayutthaya is very similar to Sukhothai, except it is a much busier city and the attractions are spread out over a much larger area, not confined to a single park. It is a northern suburb of Bangkok and can easily be reached by taxi or tour bus in 30-60 minutes depending on traffic. The day I went was New Year’s day and all the temples were packed with people. The Historic City of Ayutthaya is a cultural site that is recognized into the list of UNESCO World Heritage Sites in Thailand. It was added to the list in 1991 citing its role in shaping the history and culture of Thailand. The old city of Ayutthaya spans about 400 years in history. It was once a prosperous capital of trade and politics in Thailand. However, just as it quickly rose to its height, it was also defaced and abandoned. 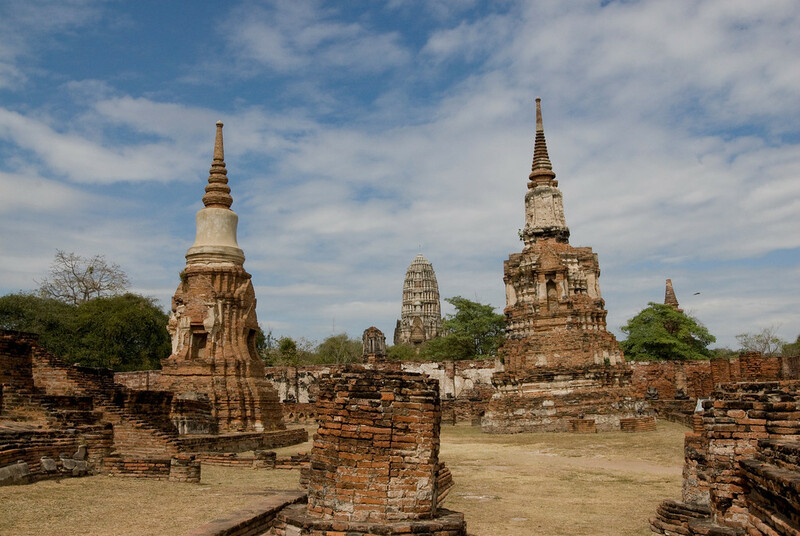 Today, what you see when you visit the Ayutthaya Historical Park is what was left of this once prosperous kingdom. The religious monuments and temples within the Historic City of Ayutthaya exemplify the grandeur and power of this once-flourishing kingdom. It was a showcase of the wealth of the Kings at that time. Today, they serve as concrete reminders of the dark phase of Thailand’s history and that this time period really did exist. There are several options to get to the Historic City of Ayutthaya. The first option is to drive by car following a wide range of route options such as Highway 1, Highway 304, Highway 306 or Expressway No.9. Your choice of route to take will vary on where you are coming from. You can also hire a taxi to get you there. The cheapest way to travel to Ayutthaya is via train. However, it is also the most scenic option. You must go to the Hualamphong Train Station in Bangkok and it will stop in Ayutthaya. The average duration of the trip is 1 hour and 20 minutes or up to 2 hours depending on the type of train you take. Finally, you can travel to Ayutthaya by bus. You must head to Bangkok’s Northern Bus Terminal or in Moh Chit. There are buses you can ride there that will take you to Ayutthaya. The trip can take either 1 and a half hour or 2 hours. 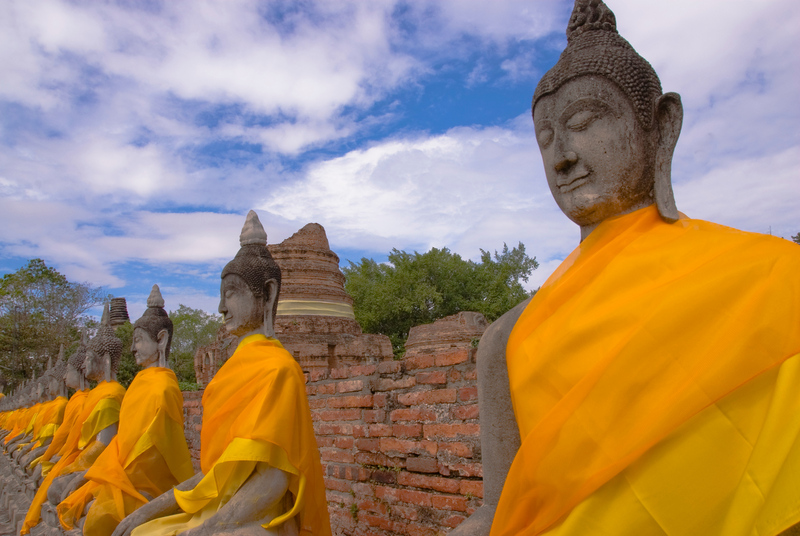 The Ayutthaya Historical Park is the main attraction within the UNESCO site of the Historic City of Ayutthaya. This park was established to preserve the ruins of the old city of Ayutthaya. This city was founded in the mid-14th century by King Ramathibodi I until it was captured by the Burmese in 1569. The artistic objects and the elements from the temples and other structures in the city were lost and destroyed in the process, even though they were not pillaged. It was subsequently defeated by the Burmese Army in 1767, which no longer rendered it as the capital of the Thai kingdom. Two centuries later, in 1969 to be specific, the renovation and reconstruction job was conducted at the old city of Ayutthaya (particularly within the area now covered within the Ayutthaya Historical Park). Since it was named a historical park in 1976, the efforts at its conservation grew more serious and intense. – This Buddhist temple is one of the main temples that belong within the Ayutthaya Historical Park. According to researchers, this temple was constructed in 1374 by King Borommaracha I. – This is considered as the holiest temple within the site of the old Royal Palace in Ayutthaya, the ancient capital of Thailand. The temple is considered as the grandest and most beautiful of all temples within the old city. – This is another Buddhist temple located within Ayutthaya and was founded in 1424. The main prang of the temple is considered as one of the best in Ayutthaya. You can find this temple north of Wat Mahathat. – This is one of the most recognizable temples within the ruins at the Historic City of Ayutthaya. The most distinctive feature of this temple is the central chedi that is surrounded by sculptures of guardian lions. There are several claims that say the temple existed even before the Ayutthaya period and researchers agree with this claim based on architectural evidence. View the complete list of UNESCO World Heritage Sites in Thailand. That is so very incredible! You capture the beauty of this site well! Flowing garments over the rock Buddhas and angle along with uniform color…Nice work Gary! That was definitely one of the highlights of my trip to Thailand…that and hearing that my train from Chiang Mai had “fallen off the tracks” and was canceled. I didn't even realize that until your comment. So many of the buddhas I've seen have been decapitated. Ayutthaya was built more recently, which is probably the reason. It is also still in use as a temple, which stops artifact poachers.